17 riders left Hearst this morning heading for Longlac. It was a good ride with just a few mishaps. Larry Wormnest had a little encounter with the deep snow off the trail but was rescued by Randy Belliel and Dave Upthegrove but in the mist of sawing a few trees out of the way – they forgot the saw on the trail and Randy B and Dave U went back to recover the saw but Dave U found a few more trees off the trail and had to be helped out of the pucky brush…..On our way again and Ron Krupp thought we needed a little more excitement and he checked out how deep the snow was off the trail…..Stuck again….. but thanks to all of our safety people we had a bungee on board and he was pulled to safety..We had a long day today 250 miles and one of the things we have to do is gas our sleds. 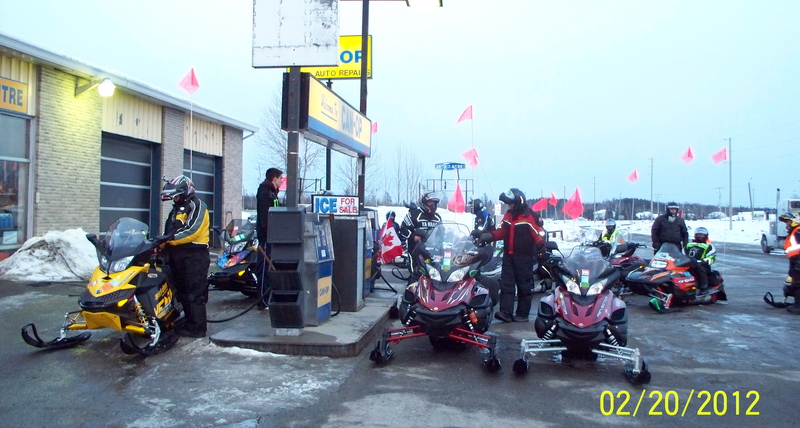 With so many sleds it takes between 20 to 30 minutes to gas everyone up. Especially when you are at a remote stop that has only one gas spigot. How is the snow holding out, Our forcast isn’t very good, rain, wintery mix, and snow. Keep up the postings. Stay safe.. Thanks for turning on your SPOT…I found you LOL Have a good run into Thunder Bay. I really enjoyed Kakebeka Falls during my cross country trek.